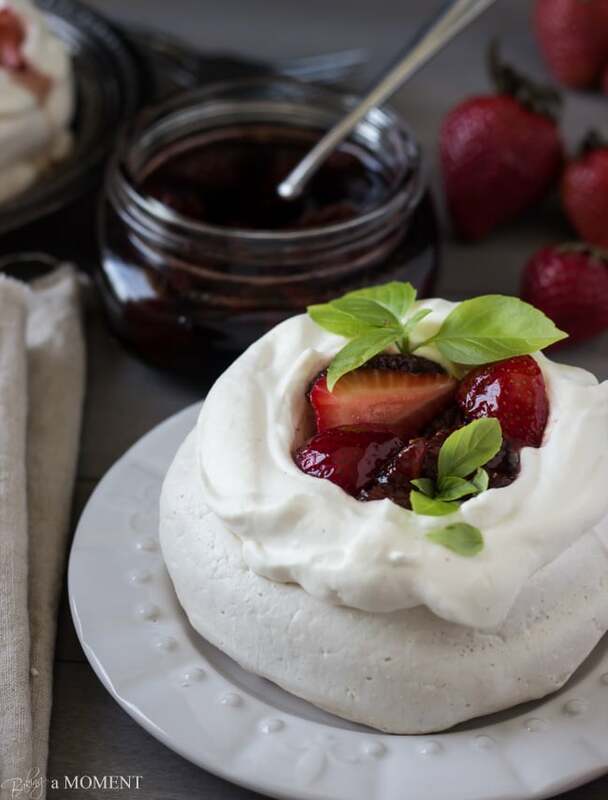 These Airy Pavlovas are Crowned with Softly Whipped Cream and topped with a Sweet Strawberry Balsamic Jam. You’ll love this Pillowy Light Baked Meringue Dessert! Naturally Gluten Free. Hi friends! I just want to say thanks so much to all of you who’ve been so kind in wishing me a speedy recovery. I’m doing lots better than I was; no more fever and just a little bit of a stuffy, achy head at this point. It sure is tough to stay healthy when the kiddos seem to pick up every bug that comes down the pike! But I’m up and around again and just trying my best to get caught up. Boy, it only takes a day or two before everything seems to just come loose at the seams. Heaven help me! Thank goodness for easy recipes! I really wanted to keep it simple for today’s post. I know it sounds kinda fancy, but just think of this as a baked meringue with whipped cream and berries. That’s really all there is to it! This dessert is all about balance. Keep the whipped cream unsweetened- the meringue is already pretty sweet. I did add the seeds of a vanilla bean though. So good! And the berries…! Oh, my goodness, this strawberry balsamic thing. I am telling YOU! It is seriously to die for. I know it maybe sounds a little strange, but it is actually a classic pairing. It doesn’t taste vinegary, per se, but the balsamic vinegar just brings something out in the berries… somehow it makes them taste even more strawberry-ish. Half the berries get simmered in sugar and balsamic, for a quick jam/preserve kinda thing, and then the other half get folded into that, so sometimes you get a berry that’s sort of chewy/syrupy, sometimes you get a fresh berry that’s tart and juicy, and all of it is slicked in this musty, fruity drizzle. That little bit of basil sure looks pretty, too, right? It’s amazing how much basil flavor permeates into the dessert, just with those few leaves scattered on top. It really compliments so well! 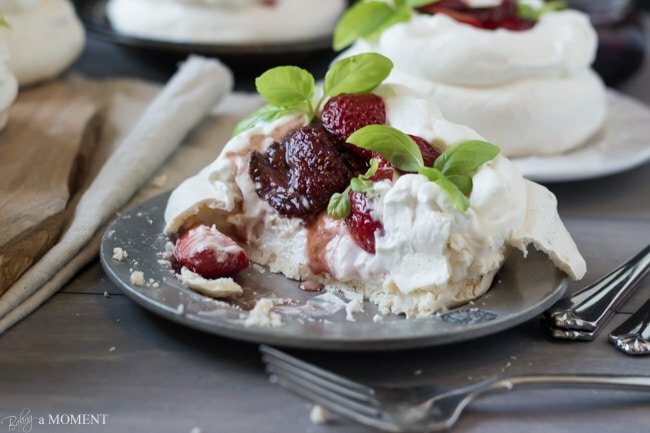 That little hit of herbal freshness just brings everything together: sweet, crumbly-marshmallowy meringue, pillowy cream, summery berries, and a hint of basil… mm! 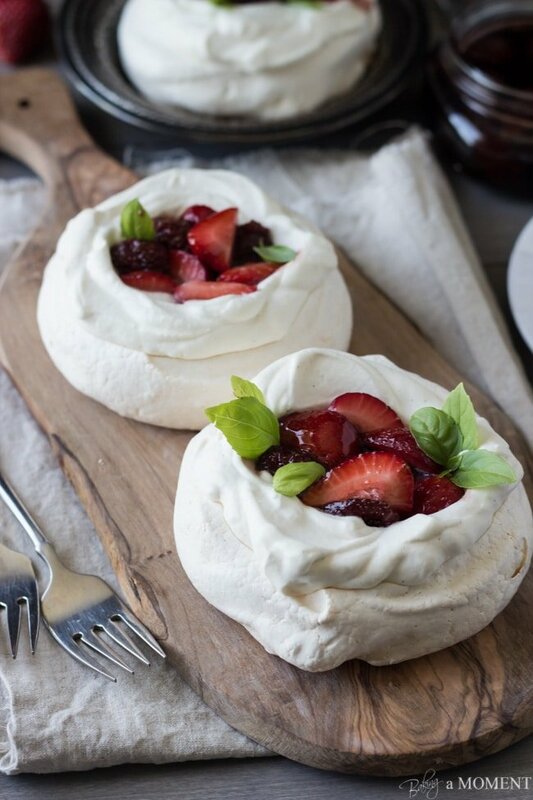 These Airy Pavlovas are Crowned with Softly Whipped Cream and topped with a Sweet Strawberry Balsamic Jam. You'll love this Pillowy Light Baked Meringue Dessert! Naturally Gluten Free. Whip the egg whites in a large bowl until frothy. Gradually and very S-L-O-W-L-Y, add in the sugar, while whipping. Continue to whip until stiff peaks form. Place 6 dollops of meringue, about 4 inches in diameter, on parchment-lined baking sheets. Use the back of a spoon to shape the meringues, creating a slight well in the centers. Bake for one hour, turn off the oven, and prop the oven door open with a wooden spoon until completely cooled. Place 1½ cups of strawberries in a wide shallow pan, along with the sugar and balsamic vinegar. Bring to a boil and then reduce the heat down to a simmer. Simmer for 10 minutes or until thick and syrupy. Cool, and fold in the remaining berries. Top each meringue with whipped cream and berries; garnish with fresh basil. You’ve got to make this dessert! It’s so super simple to prepare, and yet so elegant. I’m telling you, you will swoon! I totally did, and I’m 99% sure it wasn’t the antihistamines. Hopefully this weekend I’ll get caught up on visiting and commenting on blogs, so I’m sorry for being MIA this week! But we’ve also got little league games, my seven (!) -year old’s birthday, and eggs to dye/baskets to fill 😀 I hope you all have a lovely Easter, full of love and family and yummy treats! I’ve never made a pavlova. This is so awesome looking. I love that wooden board too. New or old. I’ve really been looking for something similar. Hope you’re feeling better and that you’re week is going well! That looks amazing! 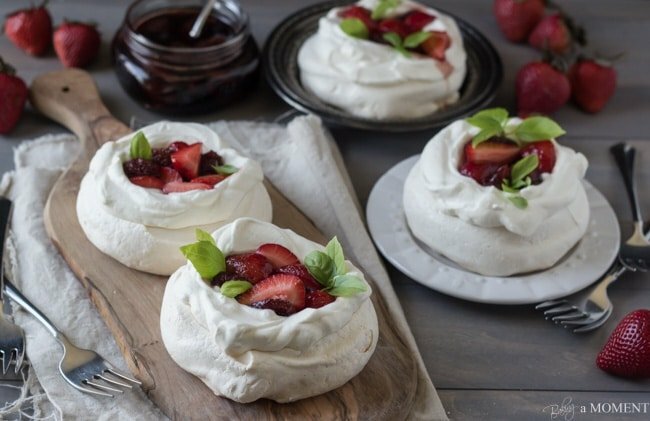 I love meringues, but I’ve never made a pavlova- I clearly have to! Hope you start feeling more like yourself quickly, Allie! I know it’s no fun to be sick especially this time of year when it’s starting to get nicer outside. And these pavlovas! They are just gorgeous! I’ve never made pavlovas before, but I’ve always wanted to. Love how billowy and soft they look and those strawberries and balsamic look so bright and luscious! pinned. I’m sorry to hear you’ve been under the weather and hope you get healthy and stay that way! Kids do bring in the funk, don’t they? 🙂 I’m a huge fan of the berry-balsamic thing, and even pour balsamic glaze over my berries and yogurt, so this looks divine! The balsamic must really balance out the sweetness of those meringues so well. Delicious dessert, Allie! Ugh, they sure do! This has been the worst winter ever for illnesses, it seems like every few weeks there’s another bug making its way thru our house! Thanks so much Marcie, and yes, the balsamic berries really brought it all into balance. Such a good combo! I’ll have to try it on yogurt, that sounds fabulous! So pretty! I love Pavlovas! Wow, you really sold these to me with your beautiful description, Allie. They sound so simple and yet so utterly delicious as well. I’ve tried pairing strawberries with balsamic vinegar before (in a strawberry cheesecake topping) and I agree … it goes so so well! Such lovely crisp photos as well. Happy Easter! Thank you so much, Lilli! They were utterly delicious 😉 I’m so happy you liked the photos! Hope your week is off to a terrific start! I’ve never made meringue before. Is it really that easy? Like, just whip whip whip whip whip and voila! Peaks form? I would love to try these but I’ve always felt intimidated by meringue. Oh no, meringue’s not scary at all! It’s a cinch! Just whip, like you said, it all comes together in a matter of minutes! Good luck, Liv! Oh, my! 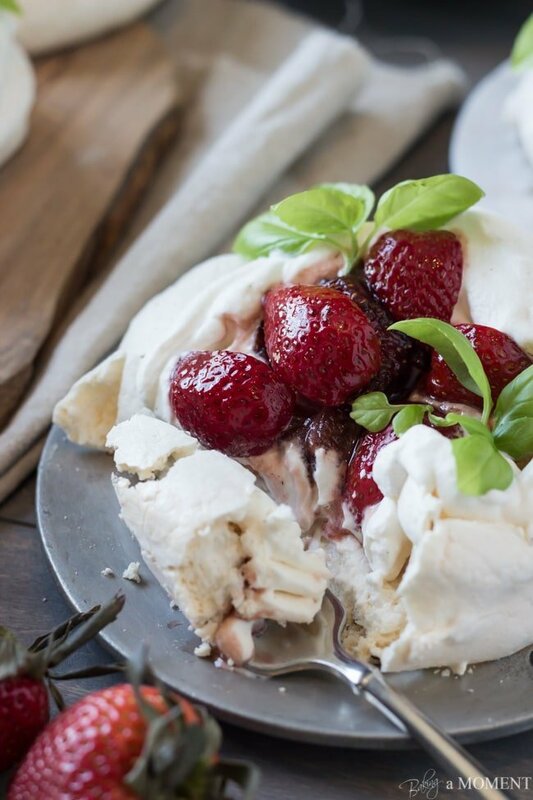 This is my dream dessert – sweet meringue, light and fluffy cream and those drool-worthy strawberries. Such a pretty dessert too! So glad to hear you are feeling better, Allie. Have a wonderful weekend! I’ve been meaning to make a pavlova for almost two years now! Hope you’re feeling much better by now Allie! 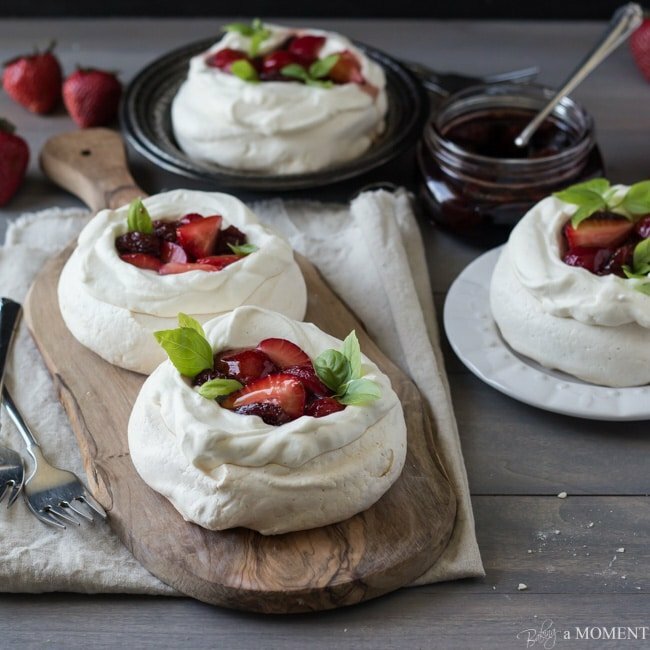 These pavlovas look wonderful, and that strawberry/balsamic combo does sound amazing indeed! Definitely something I need to try! Um… one word AMAZING. These look so good! And the pictures are just fabulous! I hope you feel better soon… I swear this long winter is bringing us all down. But your pavlovas are sure to make me feel better! I have never made a pavlova before! It looks like I need to get on this train! These look like perfect puffy clouds! I love the look of them, and they sound delicious!! Strawberries and balsamic are so amazing together! Allie these are seriously phenom girl! Thanks so much Kelly! He enjoyed his birthday and Easter too! And I’m doing much better now, thanks. Hope you guys had a fun weekend too! I am so happy to hear that you are headed to recovery, Allie! It is no fun being sick that’s for sure! 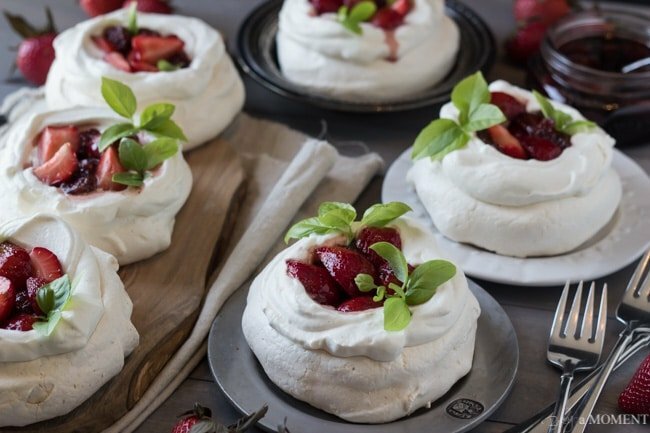 At least you have these little Pavlovas to help you through it! You take a look at these little guys and you’d think they require a gazillion ingredients! I was shocked to see that so little was required! They look so yummy, and I can’t wait to try them out! Pinned! I know they do look fancy but they are pretty simple to put together! Thanks so much for the sweet comment, Justine. And for pinning too! It’s the middle of the afternoon and one look at this post has be me craving dessert right away! Looks heavenly! These are beautiful! I feel like this would be such an easy way to impress guests. I definitely want to try! Thanks for posting!! How beautiful, and fancy, and yet so simple! I love how versatile this dessert is. I can see filling them with all sorts of different fruits and maybe even drizzle it with chocolate or something. This is a perfect basic recipe that I’m going to pin this to make many times over. Oh girl, I like the way you think! Chocolate would be awesome! Can’t wait to see what you come up with 😉 Thanks so much for pinning, my friend! How beautiful, and fancy, and yet so simple! I love how versatile this dessert is. I can see filling them with all sorts of different fruits and maybe even drizzle it with chocolate or something. This is a perfect basic recipe that I’m going to pin to make many times over. Totally gorgeous desserts! Glad you are feeling better & thanks for linking up with What’s Cookin’ Wednesday! This is such a pretty dessert. 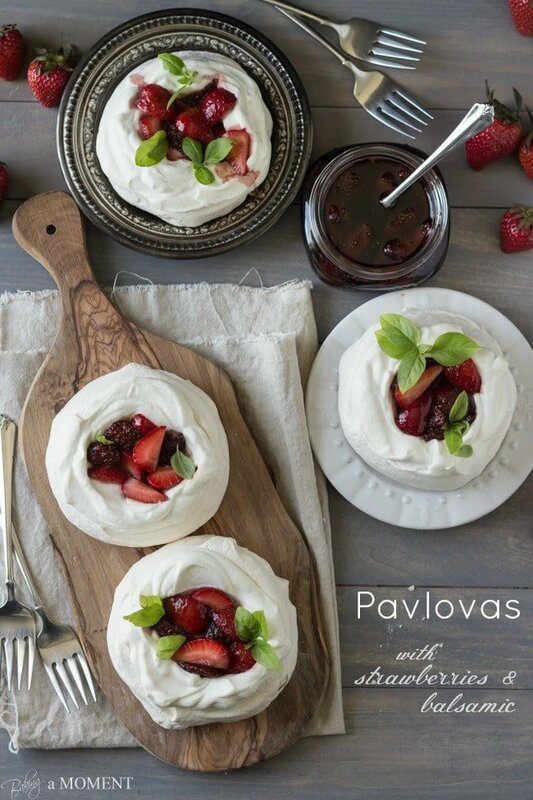 I’ve never made Pavlovas but they look so delicious and easy to make! Your pictures are amazing too, thanks for sharing the recipe :)! p.s. Found you at the Link.Create.Party! link party. I’ve never even seen a pavlova before! This looks wonderful. I have celiac and love all kinds of GF treats. Speaking of strawberry & balsamic vinegar, I bought a bottle of strawberry balsamic vinegar from this place “41 Olive” near my house in Irvine. I don’t know if they are a chain store, but it’s my favorite dressing! It doesn’t taste like vinegar at all, as you said! I’ve only used it in salads but after reading your post, I see other uses in my future! Thx! I love the sound and look of this recipe! Which is why i want to make it for my birthday on tuesday and bring it into work. I will have to make it the night before so I was wondering if its ok to make the whole thing cream and all and keep it in the fridge for the night. Or should I make the whipped cream and balsamic strawberry deliciousness that morning before I go to work. Thanks so much for sharing this!! And I obviously can’t wait to make it! Hey, that’s awesome, Ali! And happy birthday! You and your co-workers are going to love this. Here is what I would do if I were you: Make the baked meringue part the night before, and store it in an airtight container at room temperature. You can also make the strawberry balsamic part, and refrigerate. Save the whipped cream for the morning of, and put it all together just before serving (Including the fresh basil, if using. Chopped basil tends to turn black after a little while so definitely do that last minute if you can!). I think that will give you the best possible result- if you put it all together too early the meringue will get soggy and the whipped cream will weep. But this way you’ll at least get a lot of the prep out of the way in advance! I hope you enjoy and have the best birthday ever!!! Just made this and it is DELISH! I used ‘everyday’ balsamic for the sauce, then drizzled the plated dessert with ‘the good stuff.’ man oh man. Will definitely be making this version again – thank you!